Being a full member and believer in the food chain (and the benefits of grass fed beef), Philbert was put down last week and will soon be on our dinner plates. This is a LOT OF beef for just me and my husband, so we naturally wanted to offer some to family. The first thing my dad wanted to make sure of was that all the beef is EXTRA LEAN. In my eyes, I was like…gross. Give me the fat! Well, Dad, in this case I do think so! Have you ever heard the phrase, “you are what you eat, but also what your food eats”? Well… this is why! Whatever Philbert eats changes his nutrient content, which therefore affects us as we enjoy our burgers and steaks! The low-fat craze caused the fear of fat. If you were alive in the 80s and 90s, then you probably lived off margarine and low-fat snacks like I did. Hindsight is always 20/20 as they say – because why would we ever think the laundry list of ingredients in margarine or the high sugar in low fat snacks was healthy?! DOH! 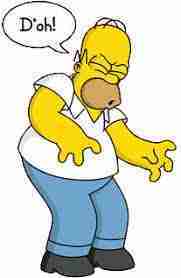 As Homer Simpson would say! – our brain is 60% fat and depends on us to intake enough to keep it performing! 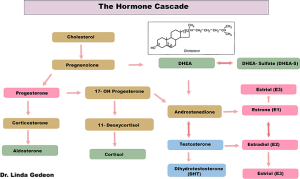 – hormones come from cholesterol – see below. If we don’t have fat (cholesterol), then we become deficient on hormones… and that will really make you feel bad! – the whole theory that Saturated fat increases heart disease keeps getting questioned and disproven. And there are more since then! This was in 2010! It’s amazing how long it takes to change minds once they are set on something! Now, there are some fats that are better than others. Getting back to Philbert, his fat is going to be better to eat than a conventionally raised cow. This is because of his diet, as discussed before. Grass fed beef contains more omega-3 fatty acids, CLA, Vitamin E, Vitamin A, potassium, iron, zinc and phosphorous than conventionally raised beef. It does come with a higher price tag, so it is not always an option for everyone. Conventional red meat will still provide good fatty acids and the benefits of eating fat, so if you are unable to get grass fed, conventional is still ok!